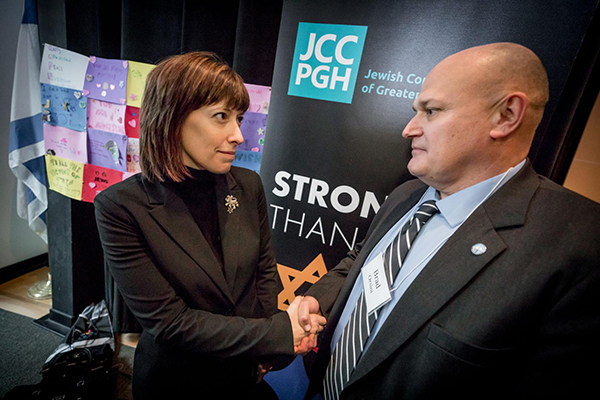 Erika B. Rudin-Luria, incoming president of Jewish-Federation of Cleveland, is greeted by Brad Orsini, director of Jewish community security for the Jewish Federation of Greater Pittsburgh. When nearly 100 leaders from Jewish federations and community centers entered Tree of Life Congregation in Pittsburgh, they noticed sights familiar to most any synagogue, like pictures of synagogue leadership lining the hallways and pews and prayer books ready for service. Similarities ended, however, when they looked across the aisles and saw evidence of the Oct. 27 massacre that claimed 11 lives in the congregation. The pews, carpet and flooring were absent. An exit sign that had been shattered was boarded up and bullet holes were scattered around the siddurim, the reading table and near the ark, said Erika B. Rudin-Luria, incoming president of Jewish Federation of Cleveland, who was part of the first community group to enter the building since the shooting. The Nov. 13 visit to the congregation, which was followed by a memorial, was part of a solidarity trip for Jewish leaders to show support to the community of Squirrel Hill, a Pittsburgh neighborhood, and to learn of the ongoing trauma support and information gathered following the deadly shooting. After the memorial and touring the community by school bus, the group heard from representatives of the FBI and leaders from the Jewish Federation of Greater Pittsburgh, Jewish Family and Children Services and the Jewish Community Center of Greater Pittsburgh at the center. Joining Rudin-Luria were Michael Hyman, president and CEO of the Mandel Jewish Community Center of Cleveland; Scott Spiegle, vice chair of Mandel JCC’s board of trustees; and Dan Zelman, treasurer of the Federation’s board of trustees. During the visit, various organizations explained how the quick response that followed the shooting was made possible by the partnerships its federation had created and supported prior to the incident, the preparedness of its JCC to house services and the services JFCS was ready to offer. Also highlighted was the need to have strong, close connections with those outside of the Jewish community, like law enforcement. Many who survived the shooting credited the training they received a month before, Rudin-Luria added. In the wake of the incident, Pittsburgh’s JCC became the location where families gathered while waiting to hear what happened to their relatives in the building, Hyman said. It also housed services, like counseling, from other agencies. The building also became the community response center for services. “The physical proximity (of the JCC) made it the only location that could house that kind of emergency response operation,” he said. Zelman said communities need to be ready to house large crowds in an easily accessible building, which he likened to Landerhaven in Mayfield Heights. The FBI featured its Victim Services Division, which is responsible for ensuring victims of crimes investigated by the FBI are able to receive services. “A lot of people wouldn’t know about the FBI, not that they wouldn’t come in if they heard something, but to let you know what resources are out there to deal with this type of thing,” Zelman said. He added he was shocked to learn from the FBI there were two false reports of a bomb threat and one false report of another active shooter all in Pittsburgh immediately following the shooting. Since the group returned to Cleveland, each spoke of the strength they saw in Pittsburgh and the community coming together. Now, it’s prepared to emphasize the importance of continuing relationships in and outside the Jewish community, supporting those organizations and strengthening community security to continue the vibrancy of Jewish life.